This past week has been really wonderful. We get into such a routine, which is very nice. He does his PT and OT in the morning, gets his stem cells, then lunch, more PT and more stem cells and then we just relax and watch movies until the evening when we try to do FaceTime for a few minutes with Calvin and the girls (Miss Katherine and Vanessa) before he heads off to school :). It’s been over a week since I’ve written an update, mostly because things have been pretty quiet around here…I was waiting for something noteworthy to share with you! 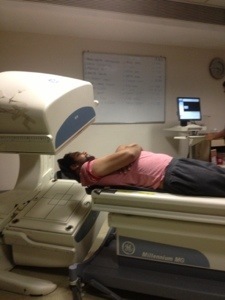 We went to Fortis Hospital to get Tyson’s brain spect scan done again on Saturday. The doctor there is so nice and really enjoys talking to us. He tells us how much he likes Mike Tyson (while throwing in a few boxing moves) and every time, asks if we know him and whether or not we are related. We laugh and I try to explain “that’s not exactly how that works..” Haha! He noticed right away that Tyson’s hands look better. He says they seem to have more muscle, which is exactly what Dr. Shroff told us when she first saw us. Below is a picture of Tyson after he got his scan. 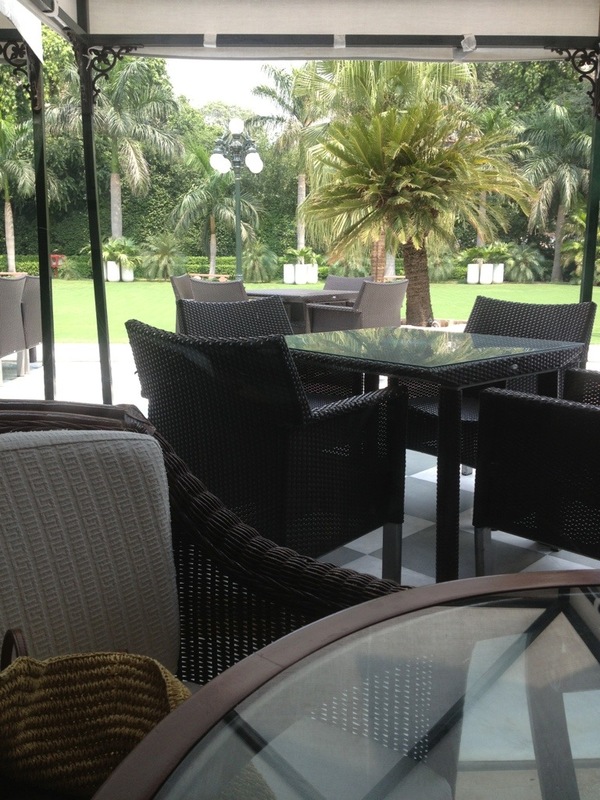 On Sunday, Tyson and I had brunch at the Imperial Hotel in Connaught Place which is near many of the embassies. It is so beautiful there! It’s about a 10-15 minute drive from the hospital. The weather has been so hot and steamy and rainy this month that we have not been able to get out of the hospital much. So, it felt good to get out and see India a bit. On our drive there and back, we saw monkeys all over the streets and sidewalks. We went down an alleyway and we saw a mommy climbing the wall with her baby on her back. I took some pics to show Cal later. The staff at the Imperial is so kind and gracious. They greet us with “Namaste”, as they put their hands together and slightly bow to us; we return the gesture, always. Here is a picture of the view from our table. You can clearly see that Tyson is continuing to improve because the black, blue, and green areas are diminishing and changing to grey, red, pink, or white. You can see a huge improvement in the middle image in the second row compared to that same image in the new scan. 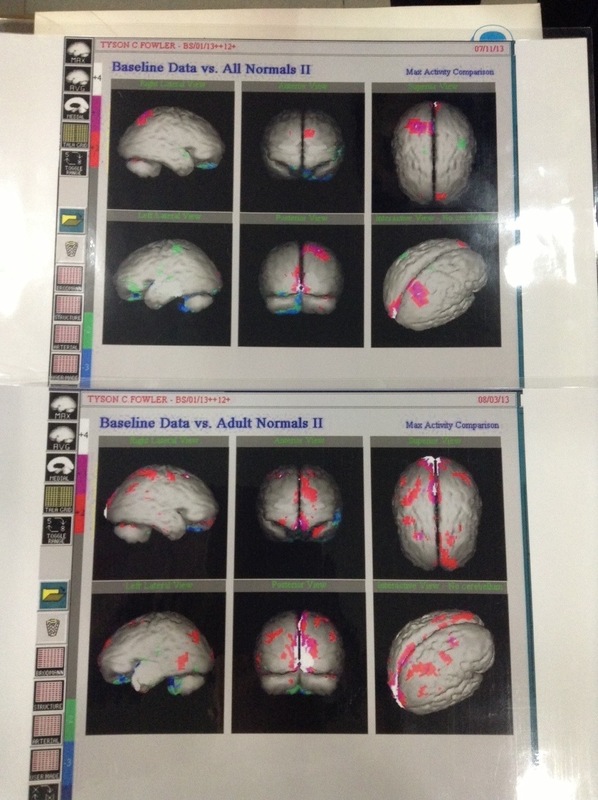 The areas that are still damaged, but recovering are his cerebellum (and another area…I forgot the name). Those areas control his balance and strength. We know clinically that those areas are improving, even though he is still extremely weak…it’s great to have medical evidence to support it as well. She explained to us that similar to the way a new born is, very weak and flaccid, that is the way his new stem cells will behave…and similar to the way a new born gains strength over time and can eventually stand and so forth, we can hopefully expect Tyson to respond the same. Overall, this is outstanding news and promising results. We are all grateful at this point that he has been stabilized. That, in itself, is an incredible accomplishment and shouldn’t be taken lightly. Remember, nothing could stop his progression at home. Also in our meeting, as I mentioned, we talked about “next steps”. As we discussed the importance of him being stabilized, she explained that in a severe and critical case like Tyson’s, we need to be aggressive and focused in the first year. Again, we do not have the luxury of time on our side simply because his Lyme has caused such destruction, triggering a deadly motor neuron disease with ALS features. At any rate, our plan is to head back to Burke Rehab as in-patient where he will stay for 2-3 wks and work out intensely (this helps train the stem cells to work more effectively and efficiently). She would like to see us in 6 wks, which is mid-September, and stay for another 6 wks. We will hopefully be able to do this and return in time for Halloween with Calvin. She would like us to stay home for the holidays and come again in February. She feels that at this time, she will hopefully (based on our progress) be able to say “come back in a year”. We are at the airport now waiting to board our plane to come home. Very sad leaving our NuTech family but we’ve been away from Calvin long enough!! I have some great videos to share of Tyson in his PT and OT. I’ll share those tomorrow with you all. Thanks again for checking in with us and for your thoughts and prayers. It truly gives us strength. Keep pushing and never give up! I am sending nothing but positive thoughts to you both!!! In this spect I’m assuming pink is a good thing correct? If so, I’m SO looking forward to ALL of the black & green disappearing once & for all!